Dynamic-Mechanical Analysis / Dynamic Mechanical Thermal Analysis (DMA / DMTA). Dynamic-Mechanical Analysis (DMA) / Dynamic Mechanical Thermal Analysis (DMTA) records the temperature-dependent viscous-elastic properties and determines the modulus of elasticity and the damping values by applying an oscillating force to the sample. DMA 242 E Artemis - Dynamic Mechanical Analyzer. 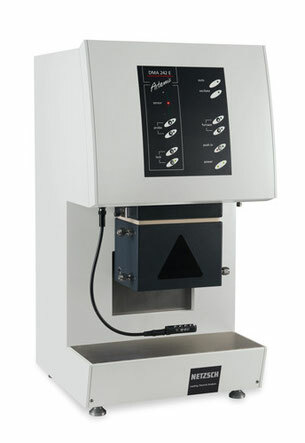 The new DMA 242 E Artemis combines ease of handling with the user-friendly Proteus®measurement and evaluation software. This makes it fast and easy to characterize the dynamic-mechanical properties as a function of frequency, temperature and time. A stepper motor with a 20-mm travel range allows for precise testing on materials which exhibit substantial changes in length during a DMA measurement. This is particularly important for the different static experiments available with the DMA 242 E Artemis; i.e., creep, relaxation and TMA mode.